Transformers is one of my most favorite franchises in the history of everything (dating back to 1980 at least). The story of the war between the Autobots and the Decepticons for control of Cybertron has held me down for decades through many an iteration. I even love those Michael Bay movies just because it has robots transforming into cars and jets and back. THAT’S ALL I NEED FAM! So when they announced last year they were making an online only animated show that’s for an older audience my interests were piqued. This show, Transformers: Combiner Wars (available now on go90 here) is what was made. Now I’m going to be honest I didn’t know what the Combiner Wars were being that I don’t read the IDW comic and I haven’t bought a Transformer show in a very long time (they cost much moolah) but I like jumping in. Transformers is Transformers right? One shall stand and one shall fall right? Naw fam. Naw. I had no idea what was going on. The 5-minute-long story starts you in the middle of a battle and you see characters you’re familiar with but they are not acting how you remember them. Like for real if your main idea of these characters is the Gen 1 cartoon – Beast Machines then really don’t even think about it. This is all different. If you’re familiar with these newer comics from IDW then I think it will make some sense but for me even as a person who’s watched Armada, some Prime and bother Robots in Disguise shows I was BAFFLED! The animation is pretty good here. The characters are toon shaded so that they look like the older cartoon but clearly they are CG as you can see moving parts and gears. The characters all look like the toys moving, and in terms of the action we see on screen it's like a kid was playing with the toys. I’m really not a fan of the voice acting. It’s really dry and you can tell that some of the people doing it ain’t seasoned vets. Not much real emotion coming from these characters as all this drama and action is happening. Like come on here the bar is high on transformers with voice actors. Peter Cullen, Frank Welker, Rob Paulson, Casey Kasem or even stars like the late, great Leonard Nimoy or Orson Wells set a standard for my ears. It’s something that took me a bit out of it. 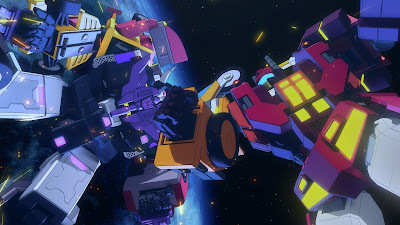 Even though I’m completely confused the ending of the first part left me wondering what was going to happen next so check back next week for thoughts on part 2 of Transformers: Combiner Wars. Hopefully the Book of Primus can help me unlock more of the story. NOTE: Below you'll find the four prequel shorts leading up to the first episode of Transformers: Combiner Wars!